The weekend was a packed one though saturday started off on a boring note…Hubby surprised by taking us to a movie and that ended up for a great weekend. The movie was just ok kind but the togetherness and family times means the most to us 🙂 And yest got to meet one of my close school friend as a new mommy and had a good time chatting. Dry roast the ingredients under ‘to roast and grind’ and grind it to a semi fine powder. Set aside. Dry roast moong dal till nice aroma comes and is slightly browned. Cool down,rinse it well and pressure cook with enough water for 4-5 whistles until its mushy. Smash it again with a laddle, set aside. In a kadai – add the onion, tomato and green chillies. Saute till tomato shrinks and raw smell leaves. Then add potato and carrot along with turmeric powder and salt and saute for 2mins. Then transfer this to the cooked dal. Either you can add more water at this stage and pressure cook for 1 whistle or just cook the veggies while boiling itself. Then add the roast and ground powder. Soak tamarind in warm water , discard the seeds and add this to sambar, then add jaggery. Allow the sambar to boil and thicken. Add required salt. Once it is boiled and reaches the desired consistency, add coriander leaves. In a kadai add the items under ‘ to temper’ and transfer this to the sambar. Switch off. Tempering at the last stage retains the flavour and aroma. 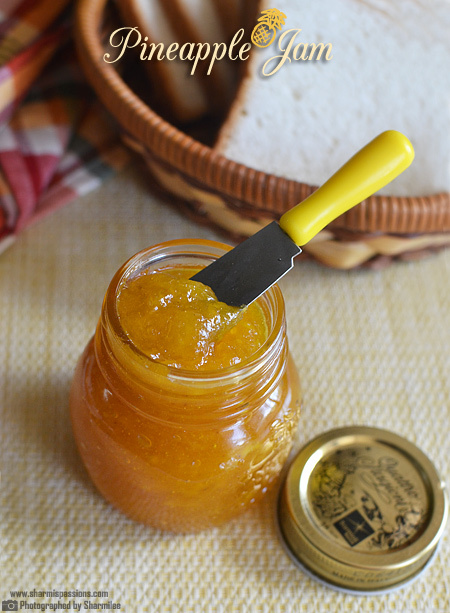 You can drizzle ghee while switching off. While roasting you can add 2 tsp of coconut too. Dont add more tamarind than mentioned as it will give a more tangy taste. You can also brinjals along with potato and carrots which is the best combo of veggies. Use small onion as it enhances the flavour of the sambar. Looks so colourful and tempting, lovely pictures as usual 🙂 kalakita po! 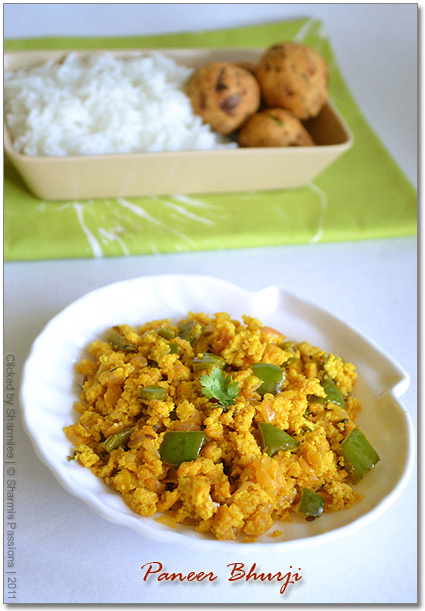 I also prepare this when I make idli..love it.. Very similar to how we make it too. Dhaniya adds a lot of flavor. Nice clicks. Lovely clicks. i too make the same way but i use toor dal. Such a colorful and tempting combo!!! Love the vessel in which sambar is kept – so cool!! Like your neat and simple presentation. And the pictures are tempting.. 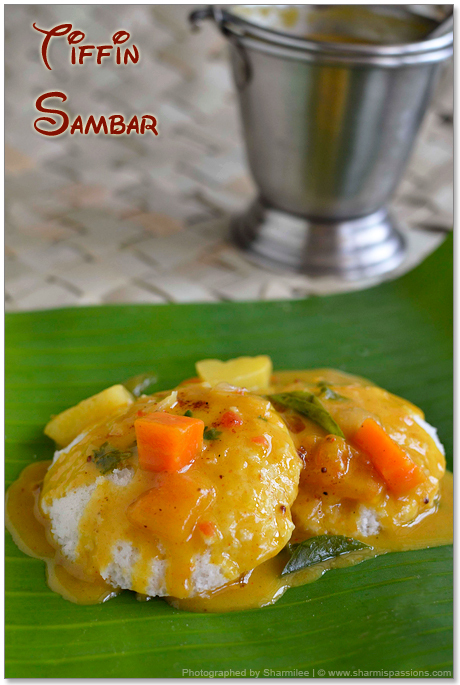 Especially love the sambar over the idli picture. 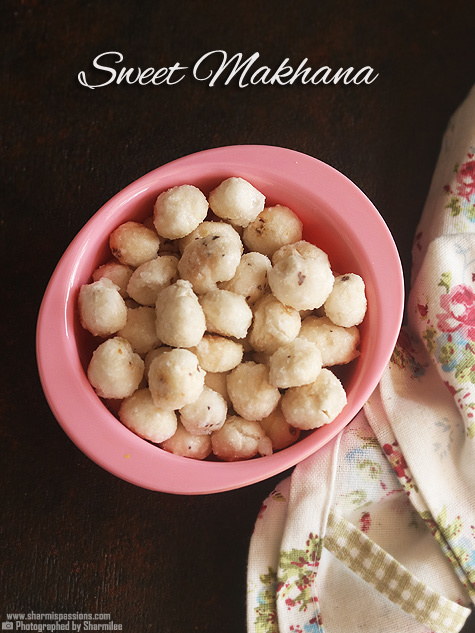 Excellent side dish for both idlies and dosas,my fav. oh sharmi… u make me drool of annapoorna sambhar… i too love it very much… hope next month will visit annapoorna… n ur sambhar looks so yumm dear… love it with dosa or pongal…. 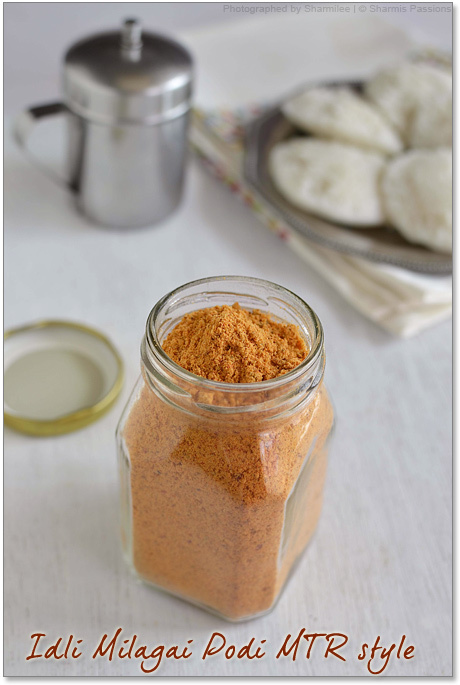 Looks delicious and I loooove the spread..
my mouth is watering seeing the idli and sambar pics…. 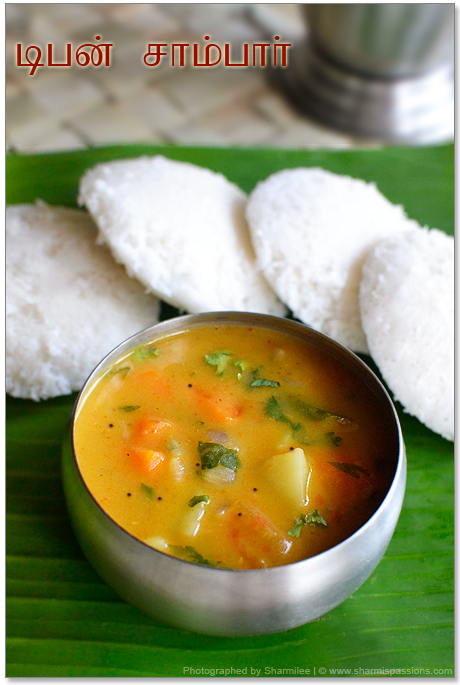 Love those spongy idlis soaking beautifully in that sambar! Beauties! Love love your presentation. Looks tempting.. Loved the click and also your sambar bucket. The sambar looks so perfect and delicious. 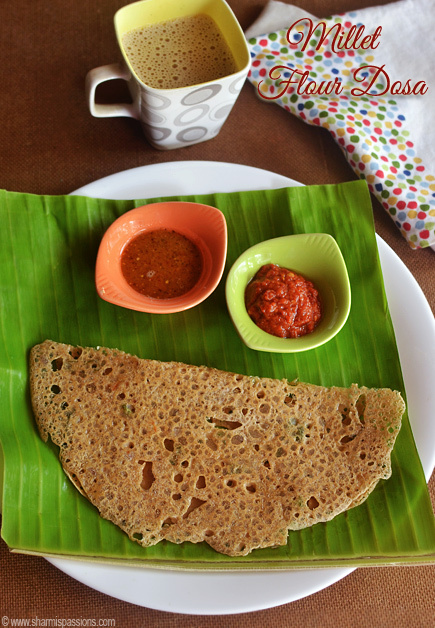 That's an mouthwatering sambar recipe…. 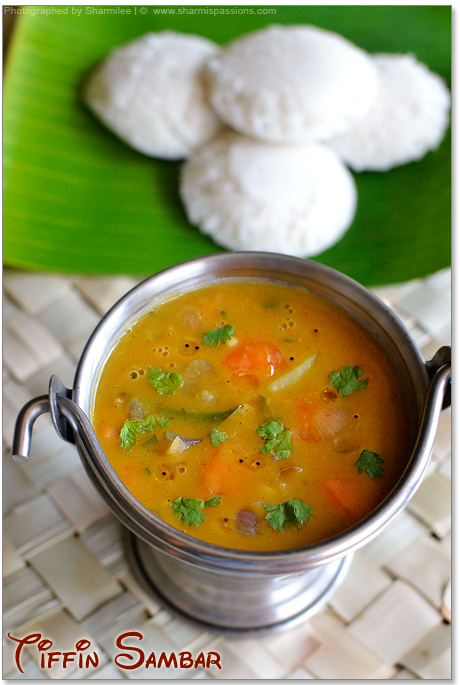 Very flavorful n tasty sambar, just finished my breakfast but ur idly-sambar pics makes me hungry 🙂 i make it same way but instead chana dal i use urad dal…will try this soon…Lovely pics as always!! one small doubt.. do you have to cut the small onions ? Just made the sambar for dinner. Absolutely delicious!!! Thanks, this is a keeper.. Thanks for providing this information, its was really good recipe..
i have a doubt…we add tamarind n boil it….u mentioned to add tamarind in the end? 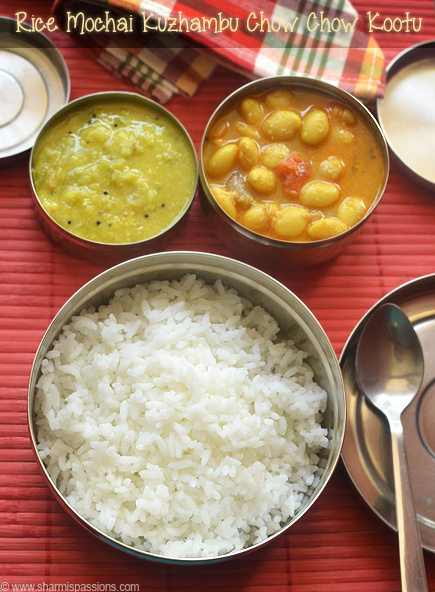 I usually use toor dal for sambhar, does moong dal make a difference? dear sharmi, sambar romba nalla irunduchu.veetla ellarume super sonnanga. 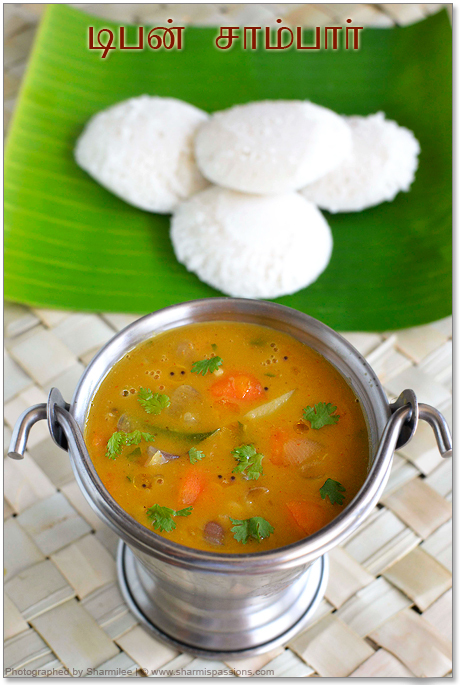 my kids like the sambar……….. This was the first item I tried from your cookery an year ago. That was the time when I was pregnant and craved for Indian food like hell. With no experience in cooking and no one to cook for me as I live in U.S. as I tried this, it came out so much well that I started to cry getting reminded of my mom. Hubby loved it tons. Thanks a lot! You made my day! ! nice your all recipes sharmi…………….. thank u so much……….. Tried yesterday, came out very well. Thanks, sharmi. Please check the last point in "My Notes" section. That point is not relevant to this recipe. do we need to soak the chana dal and split yellow moong dal before roasting ?? Sorry I misread it, no soaking required just rinse moong dal before pressure cooking if you want.